Focusing less on how (methodologies, frameworks, processes). For me, that was the most important product management trend in 2017. Surely, "Agile" talks are bottomless. Yet, I noticed a certain tiredness and dare I say, boredom among product community with regards to this topic. - Maybe that's enough? Haven't we discussed that like thousand times? Shouldn't we all have that figured by now? Indeed we should have "how" figured. As with production line, by now we have "industry standards". There was enough time to transform, adapt, optimise. What comes instead of "how" talks? Mostly "What" talks. What we want to do, build, achieve. The core of PM discipline. 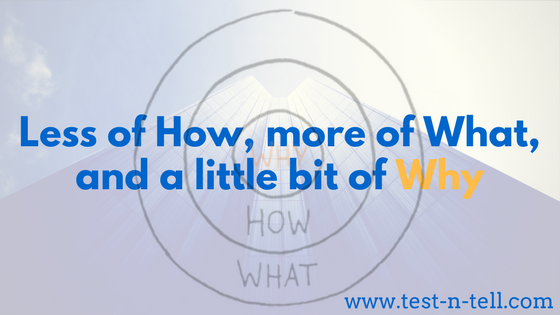 "What" inevitably leads to the source question - "Why?" Definitely, we should always start with Why. It's difficult, yes. We used to start from somebody telling us what to do, and we just executed. We mainly cared about how to execute the most efficiently. Then we took the ownership of what and made sure we don't do something that doesn't need to be done at all. Now we start asking Why? We ask our customers, our leaders, but most importantly ourselves. We want to know the work we do is meaningful. That someone needs it. Otherwise, why do it? This year we talked a lot about AI and automation that will take our jobs. I'd be happy for robots to take care of "how" and "what". Yet, I firmly believe "why" is ours, humans to own and figure out. Many happy Why's to you in the new year.